The humble pickle is almost an inseparable part of the Indian cuisine. Be it the tangy North Indian Mango pickle or the Bengali Kuler Achar, or the Banarasi Mirchi Ka Achar or the Bamboo Pickle from the North East or Coastal Kerala style Prawn Pickle, the pickles are as sweet as our childhood and as spicy as the adulthood. The word pickle derived from the Dutch word Pikel. It basically stands for the brine. The Word Achar, however, has its origin in Parsia. Pickle has its start back in the 2030 BC and that too in India! This post of mine is not about the history of the pickle but the Kerala Chemmeen Achar aka Kerala Style Prawn Pickle! 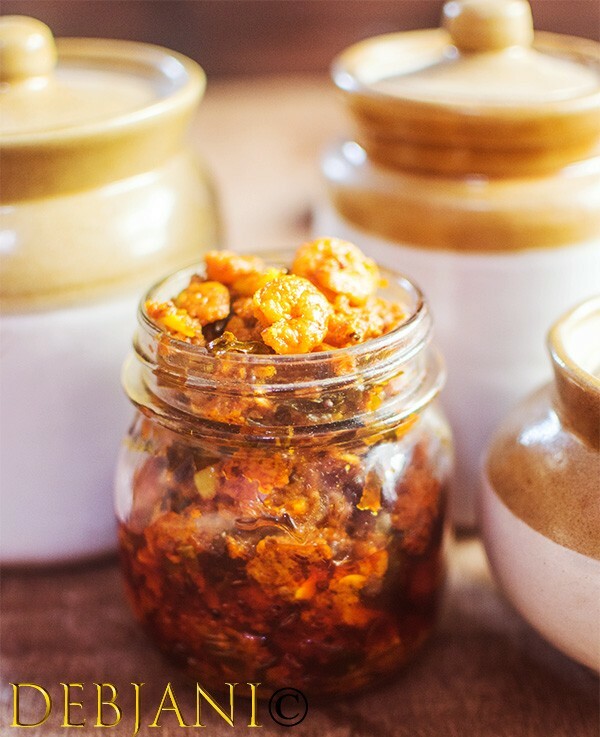 Chingri Mach and Achar, no this combination is not typically Bengali but is a family favorite. I have never seen in my family or in-laws’ to make Prawn Pickle. In fact, while checking with others upon savoring the Kerala Style Prawn Pickle for the first time, I didn’t find any mention. However, Shutki Chingri Bhorta aka the Dried Prawn Paste can obviously be considered a similar thing compared to the prawn pickle. However, In India, we not only make pickle by mixing things (the typical process of pickling) instead we make several cooked pickles as well. We mostly use Oil as the medium and Vinegar or other souring agents are used as a preservative. 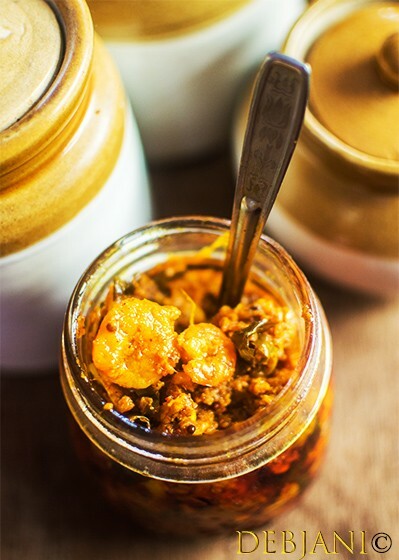 As the name goes, Kerala Style Prawn Pickle is a Kerala variety of Pickle prepared with Prawn/ Shrimp. This particular variety is also known as Chemmeen Achar as well. Chemmeen stands for prawn in Malayalam. I for the first time tasted the Kerala Style Prawn Pickle from a colleague’s lunch box. I was in Delhi at that time and had several colleagues from the southern part of the country who used to bring homemade delicacies as part of lunch. The Bengali me was superbly satisfied with the taste of the Kerala Style Prawn Pickle amongst other things and why not! After all, we Bengalis are known for our love for Prawns. When asked, she shared the recipe and I realized it is a simple one. I have been to Kerala several times for work apart from the family holidays (you may check this post for the Kerala Trip Guide). This particular variety of Achar is something I used to bring while returning. Kerala Style Prawn Pickle works very well for my working lunch at the office. It provides the touch of non-veg even without carrying a box full of non-veg with me. In addition, the recipe is super easy and hence, I make small batches of Kerala Style Prawn Pickle almost every month. Mehebub loves his portion of Prawn in any form and hence, he is also my partner in crime while finishing the Kerala Chemmeen Achar. 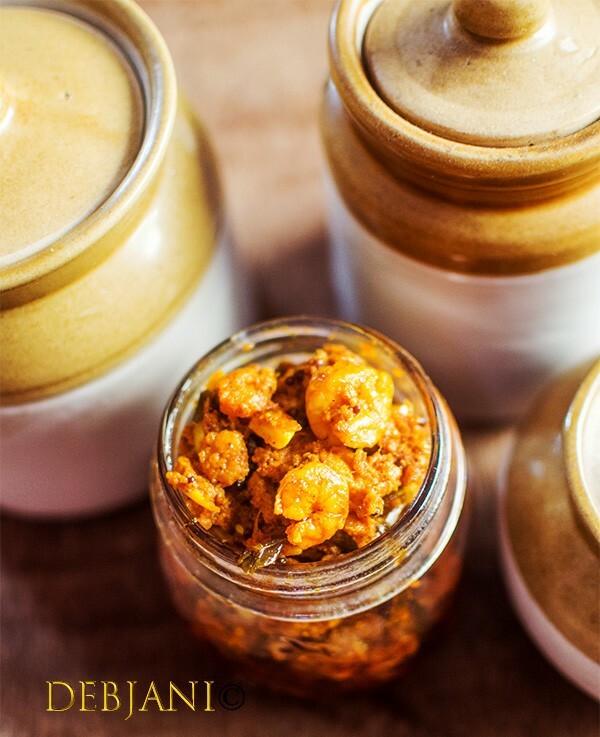 In India, two coastal regions are famous for the Prawn Pickle; Kerala for the Chemmeen Achar and Goa for the Prawn Balchao or Goanese Prawn Pickle. Both, needless to say, are, perfect to the tastebud (considering you love Prawn and Pickle both). I make both the version at home and available with one or another at any point in time. I will for sure be sharing the recipe of Prawn Balchao in future. 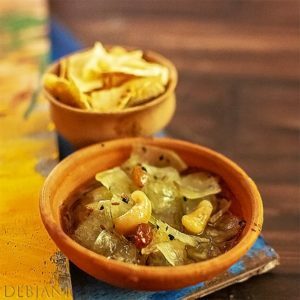 Kerala Chemmeen Achar aka Kerala Style Prawn Pickle is a spicy seafood Pickle from the southern coastal region of India. Use deshelled and deveined prawns while making the Prawn Pickle. Wash prawns thoroughly and marinate with Turmeric Powder, Red Chili Powder, and Salt. Add chopped Garlic and Julienned Ginger to the Prawn and lightly mix. Leave the marinated Prawns for 1 hour before making the Achar. Make a coarse powder of Mustard Seed, Fenugreek Seed, and Black Pepper and mix in Turmeric Powder and Red Chili Powder. 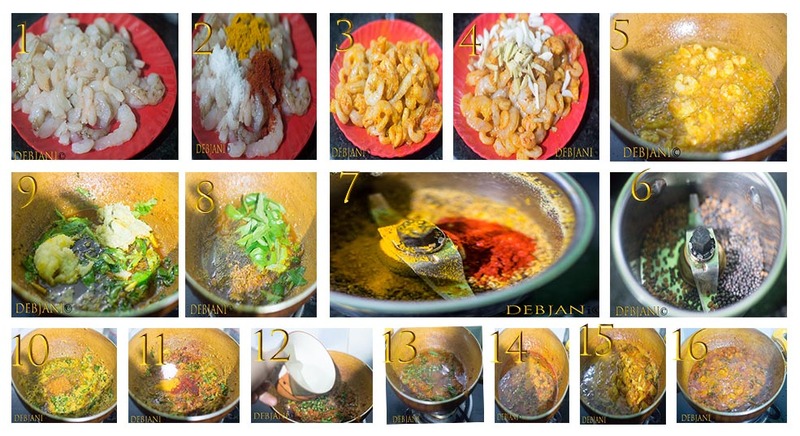 Heat Oil in a Pan and fry the marinated prawns in low flame and fry. Keep aside the fried Prawns. Temper the oil remaining in the pan with Mustard Seed and Fenugreek Seed. When the seeds crackles add Curry Leaves and cook till those turn crisp. Add Ginger and Garlic Paste followed by chopped Green Chili. Cook in low flame till the raw aroma of ginger and garlic goes. Add 1 Tbsp. of the Spice Powder prepared previously along with salt Chili Powder and Turmeric Powder. Mix properly and cook till oil comes out from the side of the mixture. Add Vinegar and 3 Tbsp. of water to the mixture and cook until the mixture starts boiling. Now add the sugar. This is completely optional however it balances the flavors. Now add Prawns and cook in low flame by covering the pan until the gravy thickens. Stir in between and adjust the spices if required. Cook until the pickle reaches desired consistency. It is better to store the Pickle container in the refrigerator. Given it is a Pickle, the recipe calls for extra salt, sourness, and spices. However, you may adjust as per taste. I use small size prawns to make the Achar. Instead of small sized ones, medium size can also be used. You can substitute Prawns with Shrimp. I prefer to use Mustard Oil to make the Prawn Pickle. You can use vegetable oil as well. Sugar is completely optional and not used authentically. However, I prefer to add little sugar to balance the flavors. The amount of oil can also be increased or decreased. I use 1 Tbsp. of Oil for each 100g of Prawns. 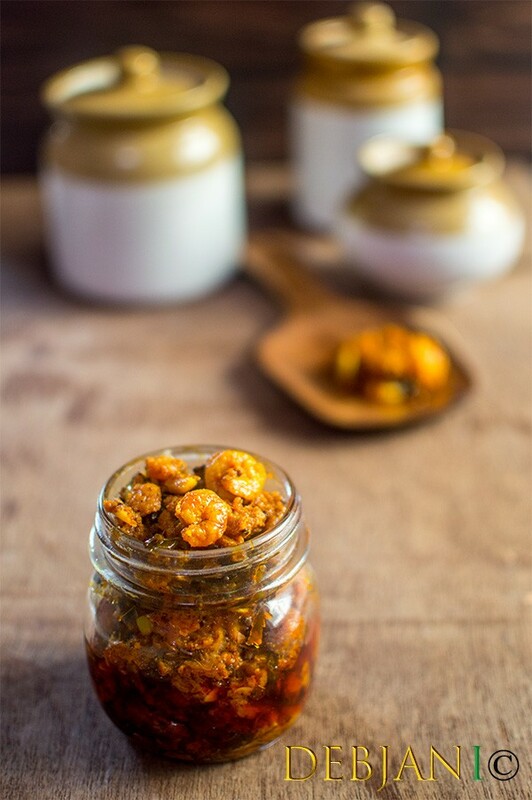 Have you tried the Chemmeen Achar aka Kerala Style Prawn Pickle Recipe from Debjanir Rannachar!